Congenital talipes equinovarus (CTEV) is a congenital foot deformity and is one of the most common congenital foot anomalies presenting to a pediatric orthopedic surgeon. Its incidence is 5–6/1000 live births. Males are more commonly affected in the ratio of 3:1. Bilateral presentation of this deformity is there in more than 40% of cases. The treatment of clubfoot by Ponseti method is has reduced the chances of surgical intervention in treatment of clubfoot. Once the deformity has been corrected, it is imperative to maintain the correction in the brace till the bone and joint have fully ossified (5–7 years of age). There are different types of brace available in the market, and hence it becomes difficult to choose which one to use. To the best of our knowledge, we have not been able to identify any such study which compares the different types of braces. We compared two commonly used braces  used in maintenance phase of CTEV. Denis Browne (DB) splint/brace  is one type which has been traditionally used, but is costly while on the other hand Steenbeek brace is economically cheaper. There are two tertiary care centers in the capital city, Patna, of Indian state Bihar. Both institutes receive around 150–200 patients in their outpatient department (OPD). There are a considerable number of pediatric patients in OPD and both institute run their own separate pediatric orthopedic clinic. Both institutes have fellowship-trained orthopedic consultants who routinely treat CTEV. All India Institute of Medical Science (AIIMS) Patna uses DB splint in all their patients while Indira Gandhi Institute of Medical Science (IGIMS) Patna uses Steenbeek brace in all their patients. The study was conducted to figure out difference in recurrence rate, complication, and acceptability among patients during their treatment. 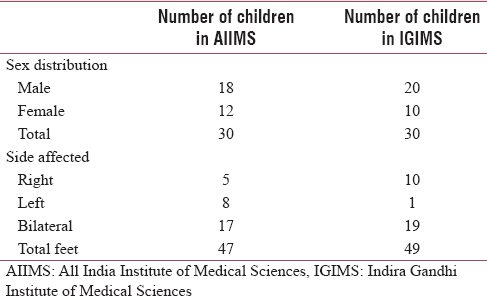 This study was conducted in tertiary care teaching hospitals. Both have on average 150 to 200 OPD patients. Both institude run separate separate pediatric orthopedic clinic. 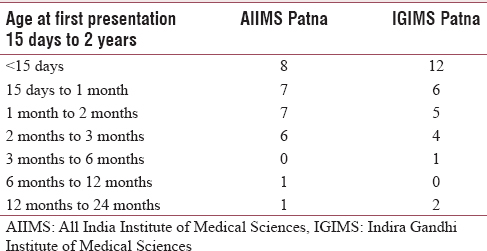 IGIMS Patna uses Steenbeek brace [Figure 1] for their patients while AIIMS Patna use DB splint [Figure 2] for their patients. This study was conducted to find out Short-term Functional Outcome and Complication Rate between Two Commonly used Braces (Denis Browne Splint and Steenbeek Brace) in Maintenance Phase of CTEV varying with race and geography. After achieving ethical clearance from the respective institutional ethical committee, a retrospective comparative study was carried out. Records of the patients treated in both the institutes between November 2014 and May 2017 were analyzed. Previously treated CTEV, but age <2 years. All the patients treated underwent thorough evaluation to find out other systemic disease, grading of the feet as per modified Pirani scoring system  (at the beginning and at each visit). The weekly cast and manipulation was done as described by Ponseti. At the end of serial casting, the call was taken by the treating surgeon whether the child requires any kind of surgical intervention or not. Interventions  if needed were of two kinds: (a) tenotomy of tight tendo achiles and (b) posteromedial soft-tissue release. Once the desired correction was achieved, the foot was braced., At AIIMS Patna, DB splint was used and at IGIMS Patna, Steenbeck brace was used. The parents were advised to keep the brace for 23 h a day till walking age (9–12 months). Once the child started walking, they were given CTEV shoe ,, in day time and splint/brace in the night. After the brace was given, the child was asked to visit fortnightly in the 1st month, then monthly for the next 2 months, and then at 3 monthly interval. Early visit was encouraged in case of any skin complication or other issues (breakage or damage of brace/splint/shoes, or change in size). All clubfeet are not the same. There is a spectrum of deformity ranging from the newborn positional deformity (which usually corrects with one or two casts) to the stiff callused foot of the adolescent whose deformed foot has never been treated. The goal of any type of CTEV management is to reduce, if not to eliminate all elements of the clubfoot deformity, hence achieving a functional, pain-free, normal-looking plantigrade, mobile, callous-free, and normally shoeable foot. Following correction, all children wear on abduction brace and were observed at different intervals at two different institutes. Clubfoot is the most common congenital foot deformity. It is well corrected by casting, followed by bracing of the feet for maintenance of correction. Foot abduction brace is used for the same. We use DB splint commonly. A simpler Steenbeck brace is now used after correction of foot. Relapse of clubfoot is the major concern after correction. On an average, relapse rate in our study is 8.33% of feet after correction. The most important cause of relapse is poor compliance of brace. Patients were regularly followed up at an interval of 7 days. Correction was continued by serial casting till foot was corrected clinically, as per the following criteria – extent of deformity, position of heel, range of dorsiflexion, shape of foot, Sinha Index, and active range of eversion and dorsiflexion of the foot on stimulating the sole of child and Pirani score. Following correction, most of the children required tenotomy;, after that, we used two different types of abduction brace  at two different institutes and observed its outcome. Fully corrected nonwalking feet were put on abduction brace to be worn for at least 23 h a day. The importance of bracing was emphasized to the parents and they were advised strictly to follow bracing protocol. All parents were advised to come regularly every month for 6 months and then 6 monthly thereafter till the age of 4 years. After that, they were told to report in case of relapse of any deformity. In case of relapse, it was corrected by the same technique as was used previously. Cases were considered as failure if (a) there was no or incomplete clinical correction or (b) complications such as joint subluxation and rocker bottom deformity occurred. The time in the brace does not need to be consecutive, but it is important for the child to wear the brace while sleeping (e.g., at night, during naps) to encourage mobility during waking hours. If the child attends day care, consider leaving the brace on in the morning and instructing the day care as to what time each day that the brace should be removed. If possible, instruct them how to remove and reapply the brace for nap times. The present study was an observational study. All the patients with corrected foot using foot abduction brace were included in this study. Thirty patients with DB splint and thirty patients with Steenbeck brace were included. The patients were examined for foot deformity by Pirani score, use of splint was noted – duration and adequacy. The condition of splint was also noted. After correction, the patients were followed up first at 15 days and then at every month for 3 months and then every three monthly till 1 year. Any deviation from the taught pattern of use of brace was labeled as inadequate use of brace. Our observations and results based on General distribution of patients at All India Institute of Medical Sciences and Indira Gandhi Institute of Medical Sciences [Table 1], Age at first presentation [Table 2], Recurrence rate, complication, and acceptability among patients during their treatment [Table 3], Total duration of painful episode on bracing [Table 4], Time taken by patients to get used to or adjust with brace/splint [Table 5], Relapse of deformity in maintenance brace [Table 6], Breakage of brace/splint [Table 7], TA tenotomy [Table 8], Complication [Table 9] and Final outcome [Table 10]. We would present our observations on thirty patients (47 feet) treated in AIIMS, Patna, and on thirty patients (49 feet) treated in IGIMS, Patna, prospectively by various methods. Minor complications developed in feet. These include superficial plaster pressure sore formation and abrasions over thigh developing as a result of inadequate padding at the superior edge of cast. All these were managed by leaving them open with some antiseptic ointment over it. A relapse of deformity was present in 2 feet in AIIMS, Patna, and 3 feet in IGIMS, Patna. In all of these five patients, the deformity recurred was adduction. On inquiring, parents accepted the poor compliance for the orthosis. These relapses were unrelated with the age of presentation and severity of deformity. All these five recurrences were managed again successfully by manipulation only. To evaluate our end results, the patients were graded on a scale of good to poor using Pirani score. A final Pirani score of 0–2 is regarded as good clinical correction achieved. 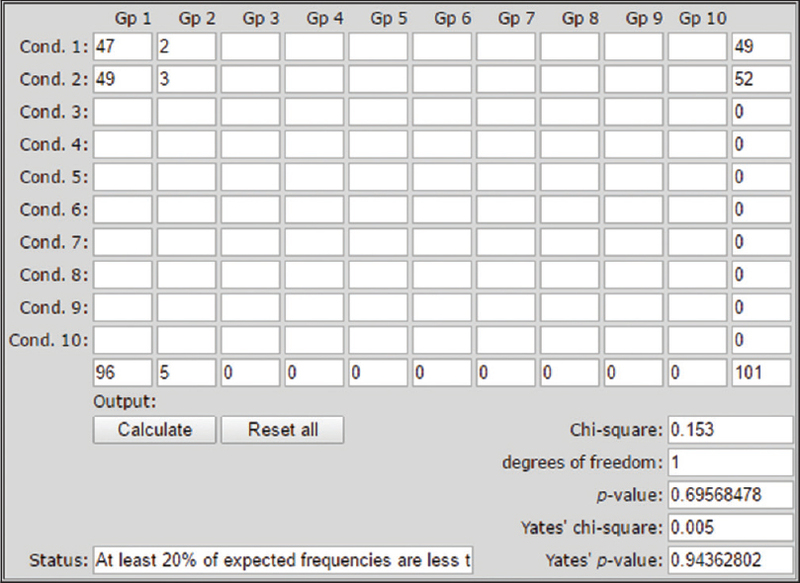 All patients were reverted to 0–2 groups, i.e., good outcome. Pirani score has high inter- and intraobserver reliability and is used as a clinical tool for assessment of clubfoot. Catterall/Pirani scoring system was used in this study to assess the severity of deformity and to assess the correction achieved after the final casting. We used two different types of foot brace, i.e., DB splint and Steenbeek brace at AIIMS, Patna, and IGIMS, Patna, respectively, and found that there is no difference in the maintenance of correction and almost has the same result. However, there are few differences in two braces with few advantages and disadvantages. More costly than Steenbeek brace. At end of one year, 2 patients using DB splint and 3 patients using Steenbeek brace reported relapse. On statistical analysis, the difference was found insignificant (P = 0.695) [Figure 5]. Denis Browne splint was found to be more comfortable to child but it was heavier and costlier compared to Steenbeek brace. 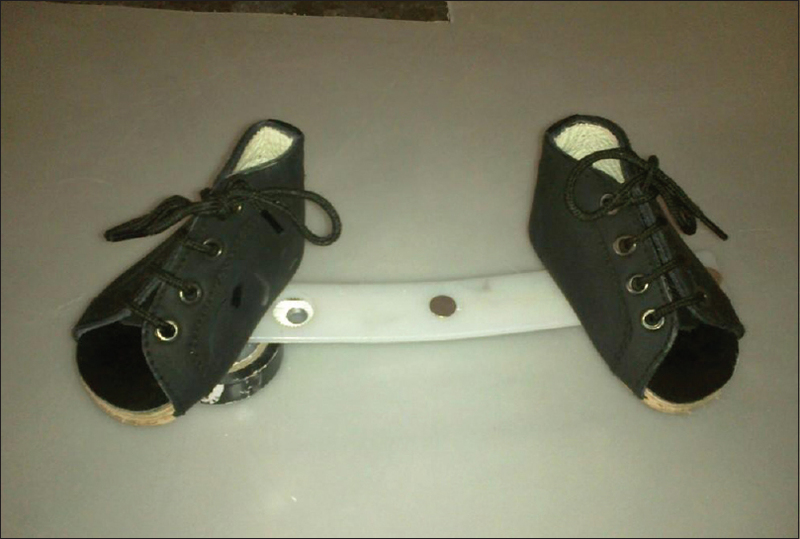 The Steenbeek brace was found to be simple, lighter and cheaper. Even after advantages and disadvantages there was no significant difference in functional outcome and complication rate between two types of braces used in the maintenance phase of corrected clubfoot. Wedge J, Michael AL. A method of treating clubfoot with malleable splints. JBJS 1983;3:108-12. Ikeda K. Conservative treatment of idiopathic clubfoot. J Pediatr Orthop 1992;12:217-23. Kite JH. Principles involved in the treatment of congenital clubfoot. JBJS 1939;21:122-9. Ponseti V, Ignacio, Smoley E. Congenital clubfoot: The results of treatment. JBJS 1963;45:134-41. Dobbs MB, Nunley R, Schoenecker PL. Long-term follow-up of patients with clubfeet treated with extensive soft-tissue release. J Bone Joint Surg Am 2006;88:986-96. Goksan SB. Treatment of congenital clubfoot with Ponseti method. Acta Orthop Traumatol Turc 2002:36:281-7. Ippolito E, Farsetti P, Caterini R, Tudisco C. Long-term comparative results in patients with congenital clubfoot treated with two different protocols. J Bone Joint Surg Am 2003;85-A: 1286-94. Khan SA. Ponseti's Manipulation in Neglected Clubfoot: Are we Joking? Proceedings of the Annual Meeting of the American Academy of Orthopaedic Surgeons; 2006. p. 63. McKay DW. New concept of and approach to clubfoot treatment: Section II – Correction of the clubfoot. J Pediatr Orthop 1983;3:10-21. Jain AK, Zulfiqar AM, Kumar S, Dhammi IK. Evaluation of foot bimalleolar angle in the management of congenital talipes equinovarus. J Pediatr Orthop 2001;21:55-9. Turco JV. Surgical correction of the resistant clubfoot. JBJS 1971;53:234-43. Nather A, Bose K. Conservative and surgical treatment of clubfoot. J Pediatr Orthop 1987;7:42-8. Göksan SB, Bursali A, Bilgili F, Sivacioğlu S, Ayanoğlu S. Ponseti technique for the correction of idiopathic clubfeet presenting up to 1 year of age. A preliminary study in children with untreated or complex deformities. Arch Orthop Trauma Surg 2006;126:15-21. Eberhardt O, Schelling K, Parsch K, Wirth T. Treatment of congenital clubfoot with Ponseti method. Z Orthop Ihre Grenzgeb 2006;144:497-501. Segev E, Keret D, Lokiec F, Yavor A, Wientroub S, Ezra E, et al. Early experience with the Ponseti method for the treatment of congenital idiopathic clubfoot. Isr Med Assoc J 2005;7:307-10. Radler C, Manner HM, Suda R, Burghardt R, Herzenberg JE, Ganger R, et al. Radiographic evaluation of idiopathic clubfeet undergoing Ponseti treatment. J Bone Joint Surg Am 2007;89:1177-83. Lourenço AF, Morcuende JA. Correction of neglected idiopathic club foot by the Ponseti method. J Bone Joint Surg Br 2007;89:378-81.